A picture tells a thousand words and you can’t sell a holiday without images. People want to see the hotels and destinations before they commit. Destinology has over 1.3 million followers on Google Plus and garners hundreds of shares on many of the images they share. 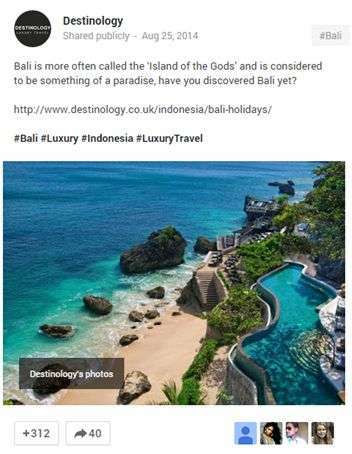 Lindsay comments, “Everyone appreciates stunning worldwide luxury travel images and we have a lot that we can feature.” Destinology is a luxury brand, so not every user sharing their photos is going to buy a holiday but it’s about more than direct sales. “People love to like, comment and share images that are striking and inspiring”, and Destinology have established themselves as a source for those who want to. Social media is not all about direct sales and using it to engage with people is extremely important as a brand. It’s also important to offer prospective customers as much information as possible and make use of all the tools you have available. Destinology for example recently teamed up with Google Maps and introduced virtual tours of some of the hotels they offer stays in, allowing users to actually explore the hotel step by step from anywhere in the world. A feature that Destinology and most other travel providers are yet to fully utilise is Google Maps capability for ‘local recommendations.’ Traditionally when travelling abroad people would buy guide books or ask for friends recommendations however, now travellers may check online first. When looking in any given area on google Maps, businesses show up and offer you the chance to review or +1 a location. This is undoubtedly a feature the travel industry should take advantage of. In doing so they are giving followers a richer relationship with the brand and giving valuable information but also encouraging them to submit their own recommendations and promote an engaged community. 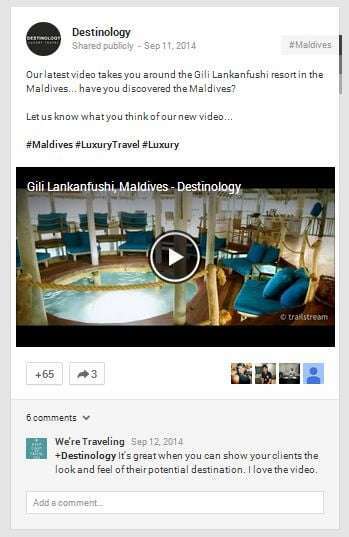 Do you also think that Google Plus is perfect for the travel industry? Please write your opinions below. Sean is a Content and Online PR Executive who writes content for brands online.